With a 300-mile range and 45-minute QuickCharge, the $49,900 Model S can carry five adults and two children in quiet comfort - and you can charge it from any outlet, without ever stopping for gas. World's first mass-produced electric vehicle offers performance, efficiency and unrivaled utility with twice the energy-efficiency of hybrids, making Model S the only car you'll ever need. Model S powertrain includes a liquid-cooled 9-inch motor, floor-mounted battery pack and a single-speed gearbox, delivering effortless acceleration, responsive handling and quiet simplicity -- no fancy clutchwork or gear-shifting required. Model S costs as little as $4 to fully charge - a bargain even if gasoline dropped to $1 per gallon. You can have affordable fun while being socially responsible. The Model S Show Car is a drivable vehicle that exemplifies Tesla's "no compromises" philosophy - an elegantly refined luxury sedan delivering optimal performance without sacrificing efficiency. Designed by Franz von Holzhausen, the car's aggressive stance gives way to a modern silhouette, with minimal front and rear overhangs for maximum space efficiency. The car's mature face defines the future of the Tesla brand and incorporates the touches from the Tesla Roadster. Environmentally friendly materials are incorporated throughout, including water-based paint for the exterior, chrome-free vegetable tanned Italian leather on interior, and 100 percent recycled PET carpeting from Futuris. HAWTHORNE, Calif.--Tesla Motors is now taking orders for the Model S, an all electric family sedan that carries seven people and travels 300 miles per charge. The Model S, which carries its charger onboard, can be recharged from any 120V, 240V or 480V outlet, with the latter taking only 45 minutes. By recharging their car while they stop for a meal, drivers can go from LA to New York in approximately the same time as a gasoline car. Moreover, the floor-mounted battery pack is designed to be changed out in less time than it takes to fill a gas tank, allowing for the possibility of battery-pack swap stations. The floor-mounted powertrain also results in unparalleled cargo room and versatility, as the volume under the front hood becomes a second trunk. Combining that with a four-bar linkage hatchback rear trunk and flat folding rear seats, the Model S can accommodate a 50-inch television, mountain bike *and* surfboard simultaneously. This packaging efficiency gives the Model S more trunk space than any other sedan on the market and more than most SUVs. "Model S doesn't compromise on performance, efficiency or utility -- it's truly the only car you need," said Tesla CEO, Chairman and Product Architect Elon Musk. "Tesla is relentlessly driving down the cost of electric vehicle technology, and this is just the first of many mainstream cars we're developing." Tesla expects to start Model S production in late 2011. The company believes it is close to receiving $350 million in federal loans to build the Model S assembly plant in California from the Dept of Energy's Advanced Technology Vehicle Manufacturing Program. Teslas do not require routine oil changes, and they have far fewer moving (and breakable) parts than internal combustion engine vehicles. They qualify for federal and state tax credits, rebates, sales tax exemptions, free parking, commuter-lane passes and other perks. Model S costs roughly $5 to drive 230 miles - a bargain even if gasoline were $1 per gallon. "Model S costs half as much as a Roadster, and it's a better value than much cheaper cars," Musk said. "The ownership cost of Model S, if you were to lease and then account for the much lower cost of electricity vs. gasoline at a likely future cost of $4 per gallon, is similar to a gasoline car with a sticker price of about $35,000. I'm positive this car will be the preferred choice of savvy consumers." San Carlos, Calif.-based Tesla Motors Inc. designs and manufactures electric vehicles with exceptional design, performance and efficiency, while conforming to all North American and European safety, environmental and durability standards. The Roadster, which has a 0-to-60 mph acceleration of 3.9 seconds and a base price of $101,500 after a federal tax credit, is the only highway-capable production EV for sale in North America and Europe. 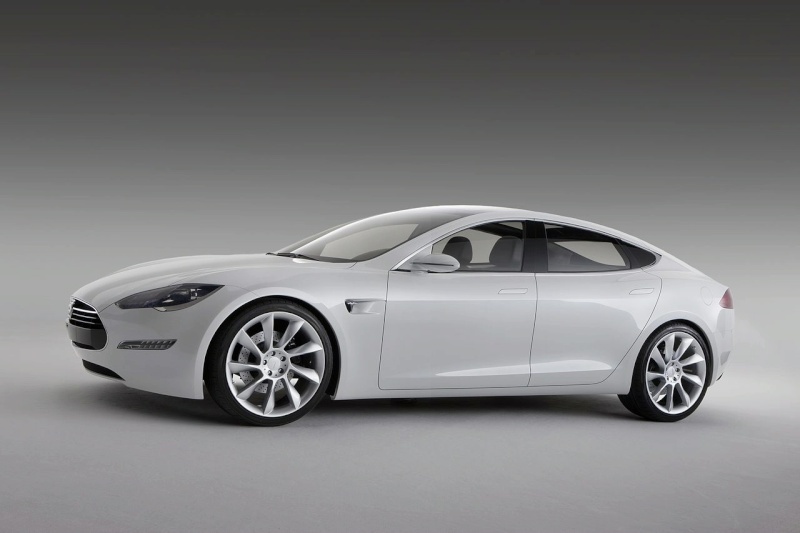 Tesla expects to begin producing the Model S sedan in late 2011.